Agility is a fast-paced sport with lots of running and jumping so make sure your wannabe athlete is structurally sound to participate in a sport that can be hard on joints. 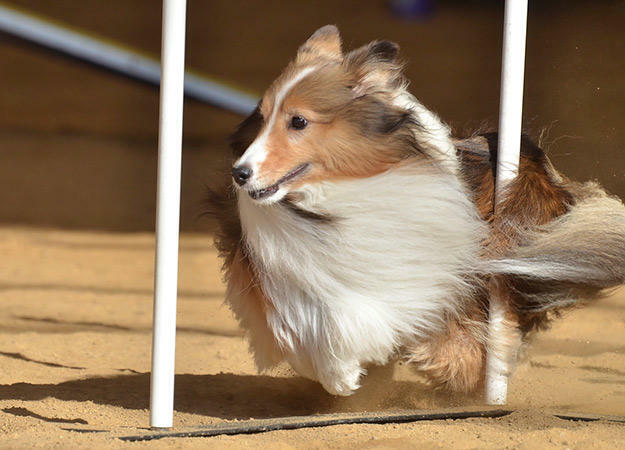 Mary E. Galloway DVM MS of RyLadd Shetland Sheepdogs, is a behaviorist and breeder of multiple agility champions. She emphasizes the importance of evaluating your dog for any structural impairments that could be exacerbated by the sport of agility. She also says it's important to understand the temperament of your dog. Does she like to run? Does he get along with other dogs? Is she a dog that looks to you for guidance or would she rather find her own path in the world? If after answering these questions, you're still not sure, find a beginner agility class or group and give it a go. Your dog will let you know what she thinks.